Am I Required to Notify my Insurance Company About an Auto Accident? Most insurance companies want to be informed of an auto accident, even if their client is not at fault. However, I would advise everyone to take a minute and read their auto insurance policy to see what it says. In Missouri, if you are not at fault, then most insurance companies will tell you to talk to the other insurance company because they don’t really want to deal with it or file a claim. Instead, they want to show that they are not losing any profit. The insurance company that represents the person who is at fault should be notified right away. One way of doing that is by getting an attorney like me, who knows most of the insurance companies that practice in this area. I can ensure that the appropriate notice is sent out right away. Car wreck attorneys know exactly how to handle car wreck and car accident cases. What Should I do if The Other Party’s Insurance Company Contacts me Asking For a Statement? The insurance companies treat lawyers as if they were some type of loathsome disease. The moment you say “I have a lawyer,” they back away from you. In fact, it’s unethical for them to talk to you once you have a lawyer. I would suggest that the injured driver tell the insurance company that they will proceed with the matter once they obtain an attorney. I do not advise anyone to speak with an insurance company or give any sort of statement without first consulting a lawyer about it. A car accident lawyer will guide you in the right direction. What if my Injury Takes a Long Time to Manifest Itself Physically? How Would That Affect my Claim? Low-impact and other non-lethal injuries can sometimes take a day or two to manifest physically, in part because of adrenaline. As soon as you start feeling discomfort, you need to get to a doctor and contact your attorney. To wait a week or two before doing so is okay, but if you start approaching a month or more, then surely the insurance company is going to say that there is a lapse of time. You may have done something else that caused the injury, but you need to report it no matter what, even if more than two months have passed. If there was an accident and the accident was the fault of someone else, then that person’s insurance company has the burden to prove that the injury was not caused by that accident. Oftentimes, that is a heavy burden for the insurance company. Experienced car accident lawyers know how to handle insurance companies and how to get the maximum possible settlement for their clients. Why is it Important to Follow Doctor’s Orders And Recommendations For an Auto Accident Claim? First, the doctor really does know best. It sounds like a line from a movie, but it’s true. The doctor knows how to progressively treat your injuries and how to get you back to a healthier state. The insurance company is looking for gaps in treatment so that they can say your injury is not related to the accident. They will claim that you were doing fine and that you were going to the doctor to get more money from the insurance company. They are looking for any missed appointments or any gaps in treatment to disprove the existence or extent of your injury. It is important to be consistent, follow the doctor’s regimen of treatment and to make all your appointments. If you must miss an appointment, then make sure the doctor instructs you on what to do in order to get better and protect your case. How Important Are Evidence And Witnesses in Auto Accident Cases? How do You Use Them? The evidence in personal injury cases varies from case to case. It’s very important that the injured person be credible, and that they don’t hide anything about their injuries. The jurors are very much considering the demeanor of the allegedly injured person and looking for inconsistencies between the statements given to the police officer, the deposition, and the testimony that’s given while on the witness stand. They are looking at everything to assess the true nature of that person’s injury. Some jurisdictions are very conservative about verdicts or damages in automobile accidents because they believe that their payout for a property damage award is going to raise their insurance costs. Due to misinformation, the jurors believe that they are paying for the injured person to recover. In addition, most jurors don’t understand subjective pain. For example, you can see a broken arm or leg, but you can’t see back pain or a slipped disk or soreness. This is another reason why it’s important to have a seasoned lawyer who can explain the subjective injuries and get the jury to see things from the injured party’s perspective. For more information on Notifying Insurance Of An Auto Accident, a free initial consultation is your next best step. Get the information and legal answers you are seeking by calling (314) 786-3536 today. Our experienced auto injury attorneys in Missouri are ready to serve you. What Types of Auto Accident Claims do You Handle? How Long do Auto Accident Cases Typically Take to Get Resolved? 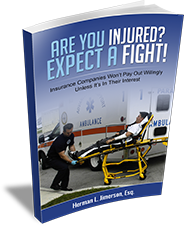 Home > Personal Injury > Am I Required to Notify my Insurance Company About an Auto Accident? Copyright © 2019, Jimerson Law Firm, P.C. All rights reserved. Are You Injured? Expect A Fight!